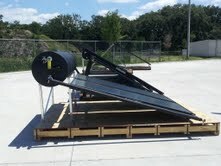 Manufactured by AET Solar, exclusively for GreenTech. The Free Flow Series is a self contained solar water heating system, the Free Flow Systems have collector(s) positioned lower than the tank and operate on the principle of natural convection. 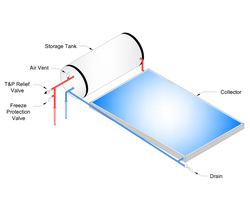 As the sun heats the water in the collector, it expands slightly and becomes lighter, causing the water to rise into the tank in the same way that a balloon rises in the air. The colder, heavier, water in the tank then sinks into the collector. These events create a continuous natural circulation. 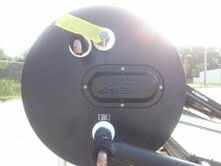 Thermosiphon Systems are automatic, simple and reliable. They do not require a pump or control. There are no moving parts. GreenTech Thermosiphon Solar water systems have Stainless Steel storage tanks and a back-up electric water heating element for use during cloudy days or during the rainy season. The back-up element can be controlled with a thermostat or a simple off/on switch. Recommended for new installations in Tropical climates. Stainless Steel Tank may be mounted on the roof or inside the attic horizontally. 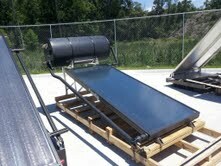 ALL Thermosiphon Systems come with a 2500 watt Backup heating element.